"A Polish-Mexican fusion. Serve while warm with sour cream and your choice of hot sauce." Shred potatoes; wring out excess water in a dish towel. Transfer to a large bowl and mix in eggs. Season with salt and pepper. Heat 1 teaspoon oil in a large skillet over medium heat. Add chorizo; cook and stir until browned, 4 to 5 minutes. Drain, reserving 1 teaspoon grease in the skillet. Add onion; cook and stir until translucent, about 4 minutes. Fold into potatoes until well-combined. Heat 1 tablespoon oil in another large skillet until almost smoking. Add heaping tablespoonfuls of the potato mixture; press down to flatten slightly. Cook until golden brown, about 2 minutes per side. Continue with remaining potato mixture. Drain on paper towels. 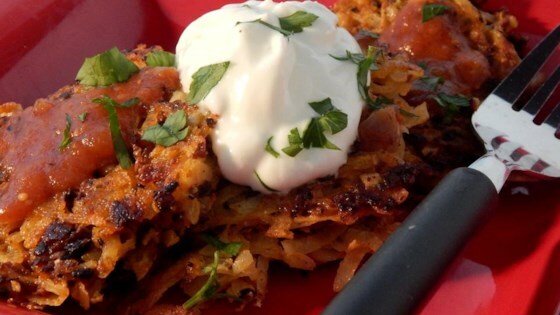 Use your food processor to make potato latkes the easy way.